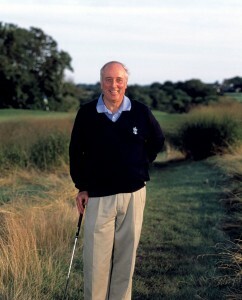 Rees Jones, the younger of the two sons of the legendary golf course architect, Robert Trent Jones, Senior, has built his own reputation in golf design during a career spanning more than four decades. Educated at Yale and the Harvard Graduate School of Design, Rees worked for his father’s firm before striking out on his own. Not only has Rees produced more than 100 new designs— among them such well-regarded courses as the Nantucket Golf Club in Massachusetts and Sandpines in Oregon—he has also assumed his late father’s mantle as “The Open Doctor,” capable of re-working or fine-tuning a championship course such as Torrey Pines or East Lake in order to strengthen their defenses against the skill of modern players armed with the latest ball-launching technology. I asked Rees to inaugurate this series of interviews with leading golf course architects for The A Position because I have always found Rees to be a thoughtful and careful observer, not just of his profession but of the golf industry and its constituent organizations. We spoke over Labor Day weekend. JS: Rees, you’ve worked on the resurrection of the status of the muni golf course in your capacity as the Open Doctor at Bethpage Black in New York, but you’ve also been the Open Doctor at places like Hazeltine, a course originally designed by your father and the site of the PGA Championship this year. Given that we’re having this big debate over the public option in health care, from your point of view as the Open Doctor, what’s the difference between treating a public patient and a private patient? REES JONES: Well, you know, the stimulus package did not include funds for any golf projects, so even if it’s public, I don’t think that the present administration is very positive towards the game of golf. Whereas during the Depression, my father built many public golf courses that really served the public well, as far as contributing to their well-being, so I think it’s a shame that this administration has an adverse opinion of the game of golf. JS: I do, too. I was shocked when I learned that the stimulus bill gave golf the same status as massage parlors, excluding it from any stimulus funds. REES JONES: Well, nobody read the stimulus bill before it passed, anyway, so, some of those things might have been changed, but they never had that opportunity. JS: When you were working on Bethpage, getting a muni ready for the greatest event in American golf, the U.S. Open, was it a different experience from what you’d had working on privately owned courses? REES JONES: Well, I’ve done it both with Bethpage and with Torrey Pines, but it really wasn’t any different because the USGA funded the construction of Bethpage, and so I was really working for the USGA. At Torrey Pines, it was the Friends of Torrey Pines that was funding it, so I was basically working for them. So in both cases, I didn’t have to go through the normal channels of a public golf course. But I think both those courses are perfectly suited for what we did and they’ve been extremely well received. The finances were good for what I dubbed at Bethpage “The Peoples’ Open.” Bethpage in 2002 was really the first time a publicly-owned facility had hosted our national championship, and it really brought to the national championship every aspect of the game of golf. JS: I just wondered if, from a practical point of view the lines of authority were any clearer working for a private club than when you were trying to do it on behalf of a publicly-owned course– or, because you were working through the USGA in both instances, was it more or less the same? REES JONES: To some degree, it made it easier to move forward. The city of San Diego had one designated person, and then there was [USGA official] Jay Rains, so, again, it was easier to get things decided and accomplished. JS: Did you have your staff try to dig up any historical records about Bethpage, or did you just base what you did on what you saw when you were out there walking the grounds? REES JONES: Well, Bethpage had never been changed. It had just become. I mean, the bunkers are still there, though some bunkers have been turned into grass pockets. Nobody’s ever done any remodeling at Bethpage, so our model was right in front of our eyes, and we just had to bring it back, to what it had been in the past. The greens had shrunk, which really is just fate—when you have a Depression, or a Second World War, they start mowing the greens smaller to save money and so [USGA Executive Director] David Fay and I just decided to take the bunkers to the greens, rather than bringing the greens back out to the bunkers, and that’s the only real change we made from the original design. JS: What was driving that decision, Rees? REES JONES: Well, the greens were relatively flat, being that it’s a public golf course. [Albert Warren] Tillinghast custom-designed his courses. Say, at Baltusrol, or Winged Foot, he had more contour on the greens which is what you would expect for a course which would host a national championship. Bethpage was his Pine Valley, because of the type of sand there, and the cross bunkers, so we just brought them back into play. We moved them a lot. We moved them out and re-located them, in light of the equipment of today, but then we re-absorbed the style back to what it was when Tillinghast first designed the course. Bethpage Black, post-Rees Jones. Photo by Larry Lambrecht. 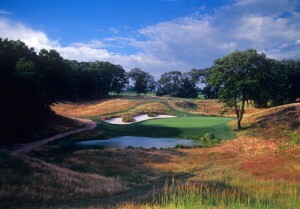 JS: would you consider the remodel at Bethpage Black one of your great successes as a golf course architect? JS: The general on the battlements…. REES JONES: “…we did it, we did it.” “Our course is beating these guys!” And then, I think for the first time ever at a golf event, they did the wave in the stands. It really changed the character of our national championship and brought the public player into that aspect of the game— and the public player is more than 50 percent of the players in America. JS: That’s why it’s sort of puzzling that as a policy matter, as a society we haven’t really looked on golf as positively as on other recreations. Nobody complains about fishing’s impact on the environment. Do you think that as an industry, we should be doing more to try to take this on? REES JONES: I do think that, especially now. When we had our slow-down and the high interest rates and the oil embargo back in the 70s, golf grew because people had more time. The auto industry found that autoworkers drove to Myrtle Beach and played golf. It’s a great escape. It takes your mind off your worries and concerns. It’s a time to hang around with your friends and therefore, I think public golf was very essential in the quality of life in America—because it’s a part of our fabric. JS: There’s a tendency among players to think, going back to Hogan’s famous comment about Oakland Hills as a “monster” in 1951, that golf courses have gotten too hard. But don’t you think now that, given what you’ve done at places like Bethpage and Torrey Pines, that the players expect an Open course to be a phenomenal challenge? They don’t want an ordinary golf course. Is that perception correct? REES JONES: Yeah, but when my father, Robert Trent Jones, Senior, had the opportunity to create Oakland Hills as the ultimate test of golf for a national championship— it was because golf courses had gone through the Depression, they’d gone through the Second World War, and Oakland Hills had to be brought back to its previous condition in order to host the 1951 U.S. Open. So Dad and [USGA Executive Director] Joe Dey decided they were going to improve the course, they did create the test, and that sort of led to all of these championship courses being refurbished, restored, or renovated in preparation for individual state championships, or the U.S. Open, and I think the players do expect them to be the ultimate challenge. It’s very nice when you have a Ben Hogan win. What you’re really trying to do is find the proper champion. When Curtis Strange won at The Country Club at Brookline, he was the number one player in the game. So, the course identified the best players at that time, and with Tiger winning at Torrey and Tiger winning at Medinah, clearly you’ve identified the best player in the game— but that’s what you’re trying to do. JS: You’re the second generation Open Doctor. Were there any special instruments in his doctor’s bag that your dad passed on to you that you still rely on and when you’re going in to renovate these championship courses? REES JONES: Well, I think my father passed on that you didn’t build a church for Easter Sunday— you had to design a course so it could be given back to the members, or the public players, after the championship is played. You have to have multiple tees, you have to have open access to the front of the greens for the average golfer to go for the green and not necessarily the flag. I think that’s what my father passed on to me. Other designers build a very tough golf course that’s very suitable for the championships, but can’t be played by the average golfer. JS: That’s a terrible dilemma. REES JONES: Well, I think the Top 100 lists have led to that. But I think that’s changing. Now it’s more a Cypress Point or an Ocean Forrest that is making the top of the lists because they have beauty, character, different types of holes, elevated greens, low-profile greens. I don’t think that the toughest golf courses are going to be as much in the Top 100 list as in the past, partly because those tough golf courses are not going to survive this slowdown in golf as well as the ones that are more playable. Ocean Forest. Photo by Larry Lambrecht. JS: There’s a kind of Darwinian weeding out of these over-the-top projects, which are also impossible to maintain. REES JONES: They’re impossible to maintain and also, if they’re public, people play them once and then they never play them again. JS: Exactly. When your dad was working on some of his projects when you were in school, did you ever go on site visits with him? Did you ever travel with him? REES JONES: Every vacation we took was where my father was building a golf course. JS: Doesn’t sound so bad…. REES JONES: We really didn’t have much money. Everybody was pretty much on the same footing after the Second World War, and we’d drive places. 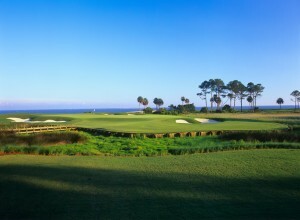 We’d drive to Myrtle Beach [where Trent Jones, Senior completed The Dunes Golf Course in 1948], or we’d take the train to Florida when he worked on [the Ocean Course at] the Ponte Vedra [Inn]. If Dad had a project, we would spend a lot of time there— in Myrtle Beach, or in Connecticut, or at the Broadmoor in Colorado Springs, where I first met Candice Bergen who was staying there with her father, Edgar Bergen and Charlie McCarthy. It was kind of fun to spend the summer with Candice Bergen and then see how famous she became. JS: No, kidding? She, she also is pretty cute. REES JONES: I knew that when she was a little kid! JS: What’s the most fun for you of what you do, Rees? REES JONES: I grew up in this business, so I was never really in it for the money. It became very popular and a very strong part of the American fabric and, therefore, we’ve been able to accomplish more because there’s more money in it now. We can do more now than when my father was building courses. He couldn’t do all the grading on a golf course because he had to spend all the money on the greens and the tees and the bunkers. The most fun is, to some degree, just having the opportunity to do a really wonderful job with the land. Not necessarily spending too much money, but having the opportunity to do it so it’ll stand the test of time. I’m also very hands on, I don’t take on too many jobs. I like to be on the ground. The golf course really is mine until it opens, and then it becomes the member’s, or the public’s, but it’s sort of mine to deal with until it opens and then I have to give it away. I have to move on to another project. The other good part of my business is you get to meet a lot of quality people who become life-long friends. JS: That’s what I like about it most. The people willing to take on a golf development project— which, after all, is a very risky enterprise–tend to be risk takers, strong personalities. That’s the part I like about it the most, too. REES JONES: I think when I get the most out of it is when we open it and it exceeds the client’s expectations, which I’m always trying to do. JS: Does your company maintain an on-going relationship with the clients? Do you come back and take a look at things in two years, or five years? REES JONES: Well, I’ve been doing that, like at Congressional now for 20 years. I’ve been doing that at the Atlanta Athletic Club for 32 years. At Baltusrol I’ve been working on the upper course for 20 years. We develop a long-time relationship with a club, and, continues to improve it, especially as the equipment has changed, and the clubs move forward on improving their facilities. Same thing with golf courses like Nantucket, or Haig Point or Ocean Forest. We go back frequently, tweak it a little bit, make some changes, and that’s kind of nice. We can learn a lot after a course opens. Maybe there ought to be another bunker here, or maybe we ought to extend the green there. Same thing at the Atlanta Athletic Club. We re-did the course before the 2001 PGA and now we’ve re-done it again before 2011 PGA. We’re rebuilding twelve of the greens at Medinah this year to make them all USGA spec greens. Now they will match the ones we did for the 2006 PGA. It’s a critical time as we’re getting ready for the Ryder Cup [in 2012], and there’re always things to do. So the long-term relationships are very important for the clubs, as well as myself. AAC-Highlands Course. Photo by Larry Lambecht. JS: You mentioned that when you first joined the profession, it wasn’t for the money. What would the fees have been, typically, in the 50s or early 60s, for 18-holes? REES JONES: Well, I’d actually hate to tell because in this slowdown clients might try to get those fees again! JS: I found the invoice from Chandler Eagan for designing the Eastmoreland golf course for the City of Portland in 1917, and as I recall he charged $750. 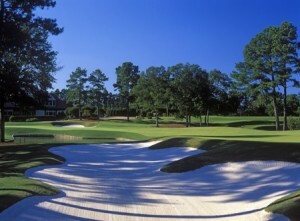 Are you surprised that golf course architects have evolved into celebrities of a sort? REES JONES: Well, yes and no. I think golf course architects of today have evolved into celebrities, but now we’re also resurrecting the golf course architects of the past, like Mackenzie, Tillinghast and Ross. Long after their passing, they’ve become more celebrated than they were during their lives. And don’t forget, this is a form of art, and a form of art that you are interactive with. It’s not a passive thing we’re creating. It creates a lot of discussions, a lot of likes and dislikes, differences of opinion. Therefore, I think they have to put a label on who they’re talking about and that’s why golf course architects are gaining such notoriety. 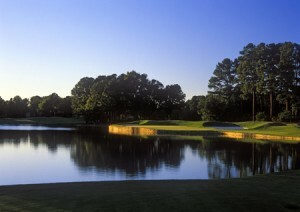 Plus, I’ve been very fortunate to have worked on courses which have hosted seven U.S. Opens, five PGA Championships, and four Ryder Cups. People want to learn more about these golf courses, and I’m the spokesperson and that helps people put a label on us and on those golf courses. JS: To say that the amount of golf design work available in the U.S. has shrunk understates the reality—it’s practically disappeared to a point in the distance. There is work overseas. Have the contacts you’ve made through, say, working on the Ryder Cup or PGA Championship venues, been of benefit to you? Have you sought, now, to take your practice international? REES JONES: Well, I was pursued very often by the Japanese and the Koreans because of my “Open Doctor” nickname. And I was approached to do a championship course outside of Madrid, Golf Club Santander. They wanted to attract a championship–and that course is already ranked in Golf Digest’s Top 100 of the World. I think my name is recognizable and I think to some degree in some of these foreign countries certain pro architects have done so many courses that they’ve diluted their abilities to distinguish one course from another. I think that’s why they’re looking more to someone such as myself to come over there and put a new brand on golf in China or Korea, and that’s great for me now because there isn’t much work in the United States. However, there is remodeling work. Right now we’re redoing some greens at Congressional, and we’re going to add some length, and we’re doing a lot of work at Medinah and we just converted the greens at Atlanta Athletic Club from bentgrass to Bermuda. We’re doing Baltusrol over, we’re doing a job outside Toronto. People are investing in their facilities here just to make sure they’re the best and to assure they’re able to survive better. Atlanta Athletic Club. Riverside 18. Photo by Larry Lambrecht. JS: When you’re approached by clients from overseas who are naïve in the sense that they don’t know golf or have a long history with golf, do they ever ask you, “don’t you need a player to put the name on the project?” Do you ever get that question, and, if you do, how do you respond to it? REES JONES: Well, I’ve only done that really once, with David Toms for the Houston Open, at Redstone Golf Club, and I wasn’t told I had to do it. They asked me if it would be okay and I chose David Toms because he became a friend of mine after he won the PGA at the Atlanta Athletic Club in 2001. And he was very helpful. But I think the name architects have just as much of an influence on the success of a project as the pros. There are a lot of pros, but there are very few with as much market value as golf course architects. JS: The two architects, or golf design firms, that have really come to the fore, in the last decade-and-a-half have been Tom Doak and Coore-Crenshaw. They’ve done well in promoting themselves as having a light touch, a “minimalist” approach, and so on. They’ve certainly had some celebrated projects. What do you think when you hear the claim that they’re the only designers able to perceive the “real” character of a site? REES JONES: Well, Coore-Crenshaw don’t undertake projects on rugged land, so that gives them a chance to sculpt the land in a less than major fashion, but if you have a rugged site, you do have to move a lot of dirt. I think Tom Doak takes on more rugged terrain, but then he leaves it alone, especially from tee to green, and lets the natural contours survive. But then you also have to make sure you have a piece of property that the ball will stop on. I mean, if you don’t have a piece of property where the ball will stop, you have to do some grading. They also both use this old St. Andrews-style bunkering that was abandoned at St. Andrews because it wasn’t maintainable. Ragged edges, with sides falling in, large bunkers and long bunker shots— they both favor that same style because it’s very effective and pleasing to the eye, but it is hard to maintain and hard to play out of. That seems to be the vogue right now, this ragged bunker style, but in this slowed-down economy, I don’t believe that’s going to survive as much because the maintenance costs are too high. JS: Have you played Sand Hills, or Bandon Dunes, or any of the courses that have gotten such acclaim in the last decade or so? REES JONES: Oh, yeah, I’ve been to Bandon Dunes and I think David McLay Kidd and Tom Doak did a phenomenal job there. That’s just a God-given piece of land—and they also had a lot of land to work with. They both did a really good job. The Coore-Crenshaw course [Bandon Trials], I didn’t play it, but I saw it being built, it’s more of an inland parcel. It’s also a nice piece of land. Staying there and just being there and being part of that theatre of golf—the food is great, the rooms are great. It’s just a great place. 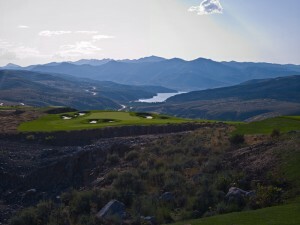 I just opened a project called Victory Ranch, near Park City, Utah with very spectacular views of the mountains and views of the valley and the skiing areas, and views of the reservoir, and I think if you can develop a great golf course with great views, it becomes a great golfing experience, and that’s what Bandon is, that’s what Victory Ranch is, that’s what Nantucket is, that’s what Ocean Forest is, and that’s what makes them so enjoyable to play on a continuing basis. Victory Ranch Club, Utah. Photo by Larry Lambrecht. JS: I was at Bandon in June and we got to go play the 12 holes that were ready to play on the Old MacDonald course. It’s an homage to Charles Blair McDonald and to great golf courses, so there’s a hole in the spirit of the Biarritz, and in the spirit of St Andrews’ Long Hole and so on. They’re not, as Mike Keiser says, imitations, nor replicas, but they’re in the spirit of the courses and holes they honor. The amazing thing about that course, Rees, is the enormous size of the greens. They’re Old Course size—double green monsters. JS: The site gets a lot of wind and I think they wanted to have a have a lot of flexibility in the set-up. They maintained a lot of gorse, at least for now, and I think it’s going to be the best of the four courses. I’m just re-enforcing what you’re saying about Bandon being such a great golf experience. REES JONES: And I think what’s going to be great for the resort is it’ll be different. You’re going to be able to play something entirely different from day to day. The one thing about doing either a MacDonald, or a [Seth] Raynor, or a [Charles] Banks homage is, they all worked together and they all sort of had the same models, with a Biarritz, and a Punchbowl and a Short, and so it probably wasn’t that hard for Jim Urbina and Tom Doak to come up with adaptations of these styles because Raynor and Banks and MacDonald used those models over and over again. There are a lot of courses like National Golf Links for them to look at. In fact, Tom Doak took a whole group people that were working on the project and walked around National Golf Links just to learn a little bit more about MacDonald’s philosophy. JS: I remember playing the Cape Hole at Mid Ocean when I went to the annual meeting of the American Society of Golf Course Architects in the late 80s, where I met you and your father and a number of the eminences of the profession for the first time, when I was just starting the research on “Driving the Green.” I remember the thrill of standing on that tee. How many times since has that hole been built? REES JONES: Well, not so many really, because MacDonald and Raynor and Banks didn’t do that many courses. They really hand-picked them, much like Tillinghast, and that’s really why I’ve done just a few golf courses every year. The detail is what makes those golf courses. I think Tom Doak is pretty good at not taking on too many projects, and so is Crenshaw. So I think you can do that if you spend the time and you have your quality people working on it, like [Doak associate] Jim Urbina, so that you really do put all the attention to details, like the pre-Depression golf courses. JS: Rees, you mentioned the other day that you have a new project in China. How’s that going and are you going to spend much time there? REES JONES: Well, I’ll be back and forth. Greg Muirhead from my office is in charge of the project. The clients are all coming over in about a week and we’re going to tour them around Victory Ranch and Ocean Forest and Bethpage, and different courses, so they can get some ideas of what we want to do over there. Kunming is a really growing area, and China has an up-and- coming middle class that has money to visit places, like this project, or even to buy real estate, so that’s real opportunity for us in an emerging market. JS: I was in China several weeks ago and one of the big things we were discussing at length was the prospect of golf being included in the 2016 Olympics. Right now, it’s taxed as an entertainment at, I believe, a rate of 25 percent. Once golf is officially classified as a sport, it goes into a new status and the tax rate reduces significantly. The official sports establishment will start putting money into golf. I think getting golf into the Olympics will have some impact in the U.S., but I think it’ll have an enormous and enduring impact in Asia. REES JONES: Plus I think they’ll have a lot of golf schools—just look what happened in Sweden, with Annika Sorenstam and Jesper Parnevik and all the players that came from the Swedish youth programs. And now Korea’s done a phenomenal job, and I think you’ll see that in China. The Korean women are taking over the LPGA Tour. I think that could be very much the case with the Chinese. We have a Korean PGA Champion, and a Korean US Amateur Champion, so I think you could see the Chinese adopt golf as a sport and probably in 5, 10, or 15 years become major players. JS: I think so, too. When the Chinese want to succeed at something, whether it’s ice skating, or diving, or whatever, they accomplish it. I think the axis of golf power will shift from North America to China at some point in the mid-21st century. REES JONES: Well, it’s a world-wide sport now, which is pretty evident by who’s on the different tours and doing well. It’s a world-wide sport for the two of us, too. We can go to different places and enjoy the game around the world. I just redid Mauna Kea, which was ranked in the Top 100 in Golf Magazine after I redid it, and, they get people from all over the world at Mauna Kea. It has such a great reputation. I think some of these Chinese courses and resorts can acquire a similar reputation, and people will travel there. JS: Rees, I want to thank you. You know, this is the inaugural interview with my friends for the new Web site The A Position. I hope that you’ve enjoyed this as much as I have. I really appreciate your doing it. REES JONES: Well, I have, too, John, and you’ve been a long-time friend and you’re very important to golf and its success, so I think your program will be a great success. JS: Very kind of you. Thanks.